Conventional lenders may require the borrower to either pay for private mortgage insurance or PMI or make a larger down payment. 20% down may be the requirement if you wish to avoid paying private mortgage insurance on a conventional loan. August 24, 2018 - If you are in the market for a home loan, chances are good that you’ve been reading up on the requirements for mortgage insurance associated with the type of mortgage you seek. Borrowers often wonder if they should accept PMI as a trade-off for a lower down payment requirement. Other borrowers may be required to make a higher down payment regardless of PMI because of credit issues. Is an FHA mortgage a better bet for those who are worried about their ability to credit-qualify for a home loan? Borrowers who have more income and better credit might choose to apply for a conventional mortgage with PMI; they don’t like the math involved when saving up 20% down even if the income question is not an issue. It’s true that conventional borrowers may cancel PMI, but only when the mortgage gets to 80% of the original appraised value. Borrowers also have the option to refinance out of PMI but there is often a seasoning period required before you can do so. FHA loan requirements for mortgage insurance are different and may be better for borrowers who need more forgiving terms for credit and income. Why? FHA loans do require a mortgage insurance payment. But the insurance in this case is not via a private company, it’s required for either 11 years or the lifetime of the loan depending on circumstances, and there is an up front mortgage insurance premium (FHA UFMIP) requirement. UFMIP can be financed into the loan amount, however. FHA mortgage loans have an overall lower down payment requirement. The borrower must pay 3.5% of the adjusted value of the home down. 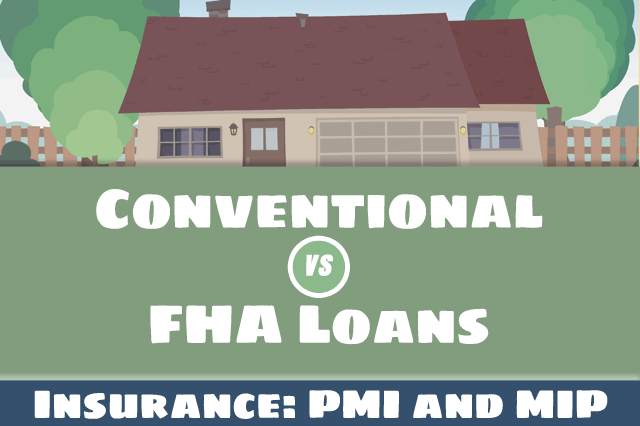 The FHA mortgage insurance premium (MIP) is based on the loan-to-value ratio, the base amount of the mortgage loan and the term of the home loan. The lower down payment, the ability to finance the UFMIP, plus the added option of refinancing the FHA mortgage into a conventional loan later to eliminate MIP makes buying a new home with an FHA mortgage a more attractive proposition for some borrowers. Talk to a loan officer today to discuss your down payment and mortgage insurance requirements for an FHA home loan to learn more.